It’s finally time. Your company has chosen the next great product you’ll develop. Hours of research, testing and development will go into it and you are certain it’s going to be a success. All that’s left is for you to get to work and, in a short while, you’re going to change the world. You may be on the cutting edge of the “next big thing,” but there is one part of your product’s development you might be overlooking: how you’re going to power and test it. Choosing a programmable power supply for your company may seem like a simple task, but in reality, it’s anything but. Much like the world of technology, aeronautics, manufacturing and communication, the world of programmable power is rapidly changing. As such, there is a good chance your company is not using the most efficient and cost-effective option for power: extended range programmable power supply. Why should you use an extended range unit? They’re highly customizable, they save space, they’re more economical and they’re the future of power supply. Technology is becoming more and more precise and having programmable power supplies that can adapt to the market is of paramount importance. While many standard programmable power supply units are adequate for uncomplicated or older equipment, the variability of an extended range unit allows greater freedom for your company. Extended range programmable power supplies offer the ability to deliver increased current at selected voltages without the need to buy more expensive higher power models. In addition to giving you greater control, extended range programmable power supply units are safer and more reliable. When selecting an extended range programmable power supply, you should look for models that provide stable output power, built-in voltage and current measurement, and panel controls that can be locked in order to protect against any unexpected changes. To protect your investments, extended range models should provide over-temperature, over-current and over-voltage protection that will protect your product by limiting the output or automatically shutting down the unit. A common problem for all manufacturing engineers is a rack that’s packed-to-the-gills with countless peripherals and wires going everywhere. Because your extended range programmable power supply allows for a myriad of customization options, however, you no longer have to buy multiple units. As a result, you can kiss your overloaded rack goodbye. 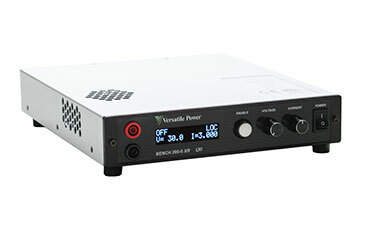 A Versatile Power BENCH XR series programmable power supply offers the same output of other power supplies in a smaller, high-density package. In fact, the BENCH XR series is 1 U high and only a half rack wide. Because it has air vents on the top, bottom and side, you can easily stack other instruments above or below it. A less cluttered rack is not only more organized and easier to manage, but it’s also safer. Possibly the most important deciding factor in choosing the right power supply unit is the price. How many times have you found the perfect product for your company only to be limited by the cost? There is absolutely no reason why you should have to sacrifice having a tailor made solution for your project because of budgetary constraints. Fortunately, an extended range unit eliminates this problem. In fact, the customization capabilities are so in-depth, that a single Versatile Power BENCH XR unit can do what 75 different units from competing brands can. The benefits of extended range are becoming increasingly more apparent and many of the world’s top manufacturers have taken note. The 2014 Frost & Sullivan reported that, “hybrid vehicles, smart applications, and critical testing equipment often require the use of high power, which drives the demand for high power [range].” Power requirements have changed rapidly in the last decade and there is a greater need for products that offer improved power management circuitry and higher wattage, voltage and kilowatt range. As previously mentioned, an extended range unit allows you to test varying degrees of power and voltage. This means your power supply can evolve just as fast as the market you are trying to serve. The benefits of an extended range programmable power unit heavily outweigh the costs. Their customization features mean they are the most precise solution, their “all-in-one” setup means you will save a significant amount of space, they are extremely cost-effective and they are the power supply unit of the future. Here at Versatile Power, our BENCH XR series is the industry-standard extended range unit. For more information on how our products can power your business, please visit us at www.versatilepower.com. Versatile Power Will Be At ITC 2017!